The modelling of the phenomena of interest for the Journal can be based on the conventional linear-elastic/elasto-plastic Fracture Mechanics concepts as well as on novel (or emerging) theories. The journal is keen to publish new/alternative modelling/design approaches, provided that such innovative theories are soundly based on the state-of-the-art knowledge and, when possible, validated through appropriate experimental results.In more general terms, cracks act as stress/strain concentrators. Accordingly, the Journal is very keen to consider for publication also those studies investigating the effect on the mechanical behaviour of materials/components/structures of different kinds of stress/strain concentrators such as defects, microstructural in-homogeneities, and, above all, notches of any kind. 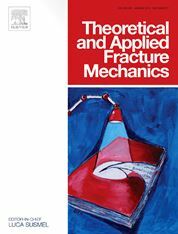 In more detail, one of the new features of Theoretical and Applied Fracture Mechanics is releasing regular issues addressing, in a systematic way, the notch mechanics problem. In this setting, as for those studies involving cracks, such special issues will consider not only conventional, but also innovative materials subjected to both time-independent and time-dependent loading.